South Korean figure skating Kim Yuna has won the gold medal at Vancouver 2010, while simultaneously setting a new world record with a score of 228.56 points. There will not be a throne luxurious enough for her in South Korea, where they already call her “Queen Yuna”. In the gold medal performance of her life at the Winter Olympics last night she conquered the field with an amazing score of 228.56 points, followed by Japan’s Mao Asada taking silver, and then in the bronze medal position Joannie Rochette of Canada. Actually, this video clip is from 2009 Skate America competition as the banners indicate. 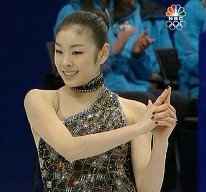 It was the second Grand Prix event for Yu-Na this competitive season, and her routine to the James Bond Medley earned her highest points ever for the short program. Of course, she had to beat the old world record for the short program, which coincidentally was her short program score from the 2009 World Figure Skating Championships held in Los Angeles, skated with equal vitality and passion to Danse Macabre (Camil Saint Saens).